Visit the NSLW website to learn more about this innovative statewide program for Nebraska’s leaders. The mission of the Nebraska Sustainability Leadership Workshop (NSLW) is to help community leaders throughout the state craft shared visions for efficient resource use, environmental quality, alternative energy, economic opportunities, effective public policy, healthy and vibrant cities, and food-based coalitions. The Joslyn Institute for Sustainable Communities received funding of $200,000 from the Nebraska Environmental Trust Fund to support the creation of this unique forum for community leaders to explore solutions to environmental challenges. 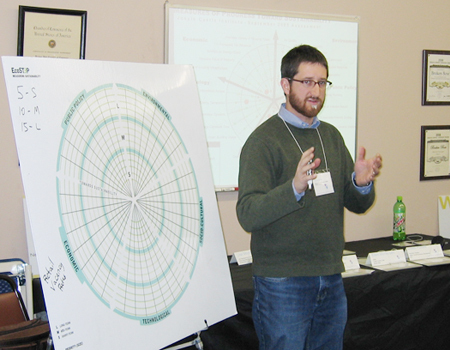 The NSLW completed its two-year series of 21 workshops in towns and cities across the state in 2010, with the goal of creating a network of sustainability leaders throughout Nebraska. The workshops were part of an innovative partnership program that is preparing Nebraska’s communities for today’s and tomorrow’s complex challenges. Our community leaders are the chief designers of our communities and their component parts—central business districts, subdivisions, schools, industries and highways—and hold significant influence over current and future public policies. Civic leaders hold enormous sway over whether or not a new development is a good fit that brings long-term economic benefits without harming the ecological or cultural fabric of the community. An uncertain energy future, growing shortages of water and other natural resources, and the unfolding consequences of climate change represent daunting challenges for Nebraska’s community leaders. Whether they live and work in sprawling cities or depopulating towns, all are struggling with myriad problems as natural resources become increasingly scarce while demands on resources continue to rise. An initiative of the Joslyn Institute, the NSLW has been a unique opportunity for community leaders from across the state to share their challenges and successes and to discover new ways to address the critical environmental, social-cultural, technological, economic and public policy challenges facing their communities. Efficient resource use Future prosperity, economic or otherwise, will not occur unless Nebraska’s community leaders find consensus on identifying and efficiently managing our most fragile natural resources. Environmental quality Degradation of water quality and supply, loss of habitat and food production to poor land use practices, and toxins in our water, soil and air threaten the very survival of plant, animal and human communities. Species failure is a loss not only for our environment, but a dire warning of our own fragile ecological condition. Alternative energy Communities need to act quickly to address future energy challenges, working on a regional and statewide scale to increase the use of clean, alternative energy and to make energy efficiency and the efficient use of resources (materials reuse and recycling) a priority through building code improvements and incentive programs. Economic opportunities Valuable natural resources—water, wind, soils, and our four-season solar climate—are underutilized or misallocated in many communities large and small. Regional cooperation, coupled with long-term planning are keys to economic sustainability and substantial improvements to quality of life. Effective public policy No single jurisdiction can afford to foot the bill for the future, yet competitive tensions within and between jurisdictions often lead to inefficiencies in natural resource allocation and infrastructure investment. Policies designed to address 19th century conditions are not suited to the global and environmental challenges of the 21st century. Community leaders must work together to develop policies and incentives based on a shared vision of preferred growth patterns, land use policies, and economic goals. Healthy, vibrant towns and cities Policies and incentives are needed to encourage healthy, walkable, and culturally rich communities that offer transportation and housing choices in mixed-use developments that concurrently protect habitat, water supplies and local culture/history. Food-based coalitions Rural/urban interests are in conflict as farmland and fragile natural environments are lost to sprawl, acreage-style development and other non-food crop uses. Leaders need to explore ways to renew ties between populations and local food communities. The results of the workshops were enlightening and valuable. JISC performed surveys among all the participants after each workshop and kept in touch with many of them. The resulting information gathered was put to good use in forming the basis for the next program JISC established: Conversations Conferences on Nebraska’s Environment and Sustainability (CCNES), the aim of which was to synthesize what was learned in the NSLW, take it to the public in a series of Conversations Conferences across the state, and encourage them to discuss the issues within a framework of five vital resources, and determine whether/how/when changes might be considered and implemented with regard to both conservation and development.